Herbert Henry Asquith, 1st Earl of Oxford and Asquith, KG, PC, KC (12 September 1852 – 15 February 1928) served as the Liberal Prime Minister of the United Kingdom from 1908 to 1916. Until 5 January 1988, he had been the longest continuously serving Prime Minister in the 20th century. He was not, however, in favour of the right of women to vote. As Prime Minister, he led the Liberal Party to a series of domestic reforms, including social insurance and the reduction of the power of the House of Lords. He led the nation into the First World War, but a series of military and political crises led to his replacement in late 1916 by David Lloyd George. His falling out with Lloyd George played a major part in the downfall of the Liberal Party. 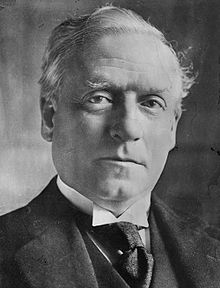 His ministry was significant for the Old Age Pension (1908), National Insurance Act (1911) and the Parliamentary Act (1911), which restricted the power of the House of Lords. Asquith's descendants include: ambassador Dominic Asquith (great-grandson), actress Helena Bonham Carter (great-granddaughter) and actress Anna Chancellor (great-great-granddaughter). ↑ "HH Asquith (1852–1928)". BBC. Retrieved 16 December 2009. This page was last changed on 7 October 2017, at 10:08.